"This recipe has won one blue ribbon and one red ribbon. They're chewy and have a wonderful flavor." Preheat oven to 350 degrees F (175 degrees C). Grease one 9x9 inch square pan. In a mixer bowl combine the flour, 1/2 cup shortening and the sugar. Beat at low speed until crumbly. Press mixture into the bottom of the prepared pan. Combine preserves , raisins and chocolate pieces, stirring until blended. Set aside. In a saucepan combine the honey and the butter or margarine. Cook and stir until melted. Stir in the oats, coconuts, almonds and sesame seeds until blended. Spread the raspberry preserve mixture over the hot crust, spoon oat mixture on top, spreading evenly to edges of pan. Bake for an additional 15 to 20 minutes or until lightly browned. Cut into bars to serve. Very tasty and not too sweet. 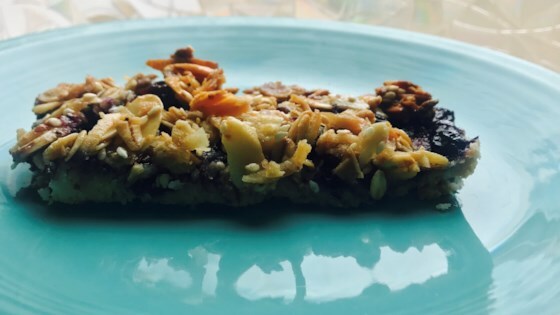 A cross between a granola bar and a conventional square. It does crumble a bit, so be sure to have a plate or napkin on hand! The flavors of this dish are amazing but the bars don't hold well together. I'm planning on using it as a topping for ice cream! Made this for the kids to snack on :D Smells GREAT! ?